Have just returned from a week split between Latvia and Estonia - both fantastic. Also learned lots about mushrooming, herb tea concocting and general foraging from Ilona, our supremely hospitable and generous host. Am quite obsessed with finding good mushrooming sites now that I'm home. Forest floors beware! Ilona's garden was also steeped in family history, with plants dating back to her grandmother's pre-Soviet garden, and a gnarly, sprawly apple tree grafted with several different varieties by her great-grandfather which still bears fruit today. Talking plants with her was fascinating, and we found that we have quite a lot of flowers, and a shared taste in unfussy gardening in common. However, some things that I love, like verbena bonariensis, while fine in an Estonian summer (and seen in swathes planted in Latvia's capital, Riga) would not take kindly to -30 degrees in winter, so have to be viewed as annuals only. Her golden rod, astilbes, phlox, peonies, echinacea (which I've always found a bit tricky) and sedums are obviously tough plants as they have persisted over generations through such incredibly harsh winters. 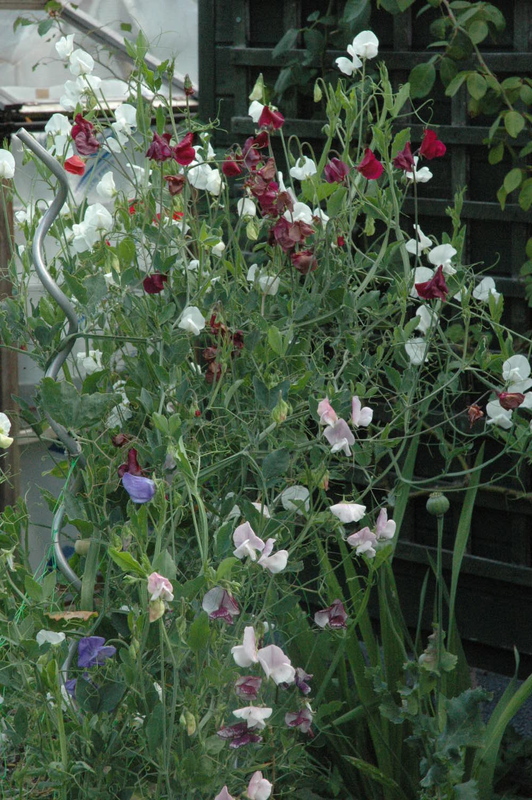 They deserve more than an RHS award of garden merit for showing such staying power! Her generous garden is so different to my own - wrapping all around her gorgeous long, low wooden house, overlooking a beautiful, forest fringed lake. In my own garden, my planting is often to screen neighbouring houses and to create a feeling of privacy, whilst in hers, tall bulky planting would be the last thing needed as it would block out that amazing view. Oooh, such a lovely challenge though! Returning home to Birmingham, it was straight to work with the cutting scissors in order to stop my productive flowers setting seed and giving up the ghost. 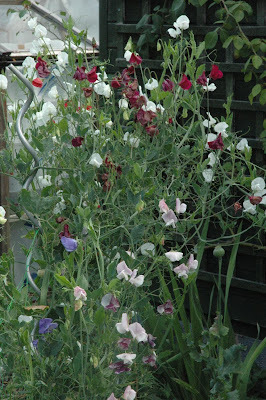 Swathes of sweet peas were therefore stuffed into any receptacle of a suitable height, and the forests of dahlias were felled and put into vases. At the allotment, badgers seem to have enjoyed all the broad beans which I didn't get time to pick before going away, stripping all the previously laden plants clean of pods. They had left me runner beans and french beans though and do not seem to have any appetite for courgettes or chard, so I didn't leave the plot empty handed. The first, early apples are crisp, sweet and ready to pick, so I'd better dust off the juicer, the tarte tatin recipe and get ready to extend all my waistbands in readiness for apple cake season. The rhubarb also seems to be getting its second wind - wonder what it tastes like juiced with apples? Too sour? Will have to try it to see. 'Charlotte' potatoes just half and hour old provided a treat for tea and I'm impressed with their yields this year. 'Rooster' doesn't seem to have produced many tubers though, so don't think I'll buy that one again next year. A pity as it is a really tasty variety - and that's saying something as I am not generally a potato fan. You have had a nice holiday I see and now back to work in the garden. 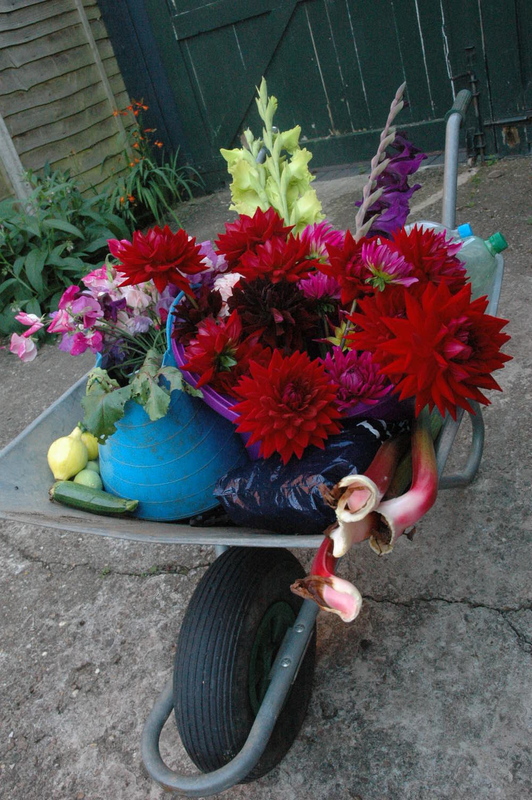 This is a fantastic harvest in your wheelbarrow, it looks great.